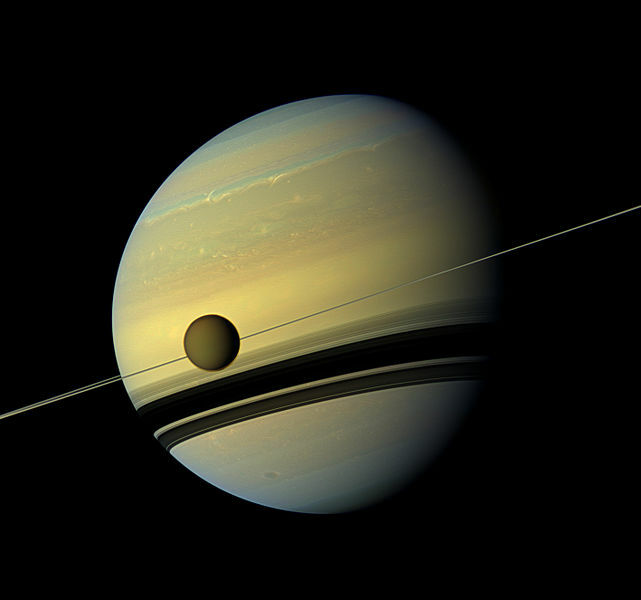 Titan is larger than even the planet Mercury. Its surface area is 83 million square kilometers, approximately equal to the territory of Europe, Asia and Africa put together. Saturn’s moon Titan was discovered on this day in 1655. It is the only satellite in the Solar System that possesses an atmosphere. It is also the largest of Saturn’s moons and the second largest in the Solar System (after Ganymede, one of Jupiter’s moons). Compared to the Earth’s Moon, it has a 50% greater diameter and 80% greater mass. It also larger that the planet Mercury. Its surface area is 83 million square kilometers, approximately equal to the territory of Europe, Asia and Africa put together. Its atmosphere is thicker than the Earth’s, with a surface pressure of 1.45 atm. Titan was discovered by Danish astronomer Christiaan Huygens, a contemporary of French king XIV, also known as the Sun King. He was actually employed by Louis XIV for a while. Huygens also studied Saturn’s rings.